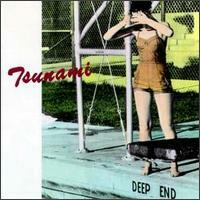 Tsunami – Deep End – But Is It Any Good? OTHER SONGS YOU MAY KNOW: Maybe if you frequented indie record stores in 1993 or so. WHAT’S IT ALL ABOUT: DIY to the extreme DC area band releases first album featuring some interesting sonic contrasts between guitar and voice. SOME WORDS, PHRASES AND CLAUSES ABOUT THIS RECORD: Thompson and Toomey loved music and playing in bands, but hated record company BS. So they formed their own band AND record company. Total DIY. It worked out. This record has some high points. They are very similar to Velocity Girl with noisy guitars and female vocals mixed a bit down. However, it all ran together for me. In short bursts, on shuffle with other tracks, this would be great. One after another, not so much. The problem is that most every song follows the same pattern. Tsunami’s ethos and DIY spirit are admirable, though, and one wonders why other bands didn’t follow their lead. Thompson and Toomey did have a great work ethic. That may be part of it. NOTES & MINUTIAE: Their record label, Simple Machines, is defunct but you can still order stuff. GRADE: B-: It’s just repetitive for me. I’m keeping it in my catalog because it would be great on shuffle on a 90’s playlist. The Isley Brothers – Shout!